Iconic South African photographer Cedric Nunn will visit the University to promote his new book, “Unsettled: The 100 Year War of Resistance by Xhosa Against Boer and British” (Archipelago Books, 2015). As part of his visit, Nunn will discuss his book—and the effects of Apartheid, in general—on Monday, Sept. 28, at 6:30 p.m. in Bird Library’s Peter Graham Scholarly Commons. The lecture is free and open to the public, and is followed by a Q&A session, moderated by Neelika Jayawardane, associate professor of English at SUNY-Oswego. In “Unsettled,” Nunn draws on his photography to capture the effects of the 100-Year War of Resistance, South Africa’s longest and most complex anti-colonial confrontation, which took place from 1779 to 1879. Most of his photos were shot in the African province of the Eastern Cape. The magnitude of Nunn’s visit to campus is not lost on its organizers. “This is a unique opportunity for our students to learn about a profound moment in human history—conveyed through the lens of one of the world’s most renowned photographers,” says Romita Ray, associate professor of art history and director of undergraduate studies in the Department of Art and Music Histories. Jayawardane, who has collaborated with Nunn in the past, describes “Unsettled” as an “invocation of exiled, silent and silenced memory,” and a call to engage with a history not meant to be remembered. “’Unsettled’ is an important document, and serves as a first step in recognizing the importance of the Xhosa resistance to the history of the Eastern Cape and South Africa. Nunn, as the photographer, becomes the narrator, generating and validating a collective memory, though it is largely absent or erased from official history,” she adds. Born in South Africa in 1957, Nunn is one of the primary documenters of the resistance to Apartheid rule. He was one of the founders of the photography movement “Afrapix,” and later shot South Africa’s first democratic elections in 1994 for the Independent Electoral Commission. 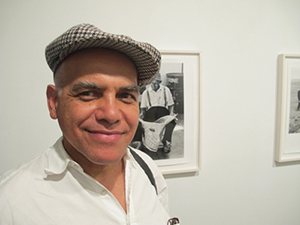 Nunn currently teaches and mentors photography students, and is a board member of the Bensusan Museum of Photography in Johannesburg. His visit is cosponsored by SUNY-Oswego; the Department of Art and Music Histories and the Democratizing Knowledge Collective, both housed in the College of Arts and Sciences; the Department of Multimedia Photography, and Design in the S.I. Newhouse School of Public Communications; and the Alexia Foundation. For more information, contact neelika.jayawardane@oswego.edu.